Log on to your Cal Poly Portal. 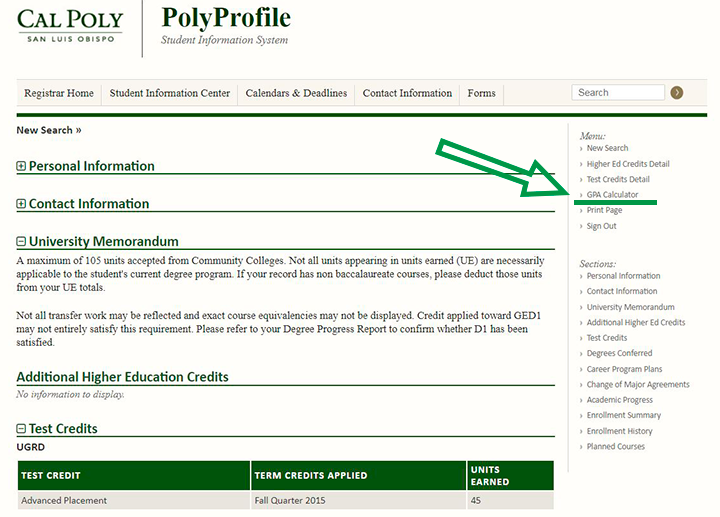 To access your GPA Calculator, select the “Academics” tab, then click on the “Poly Profile” link. 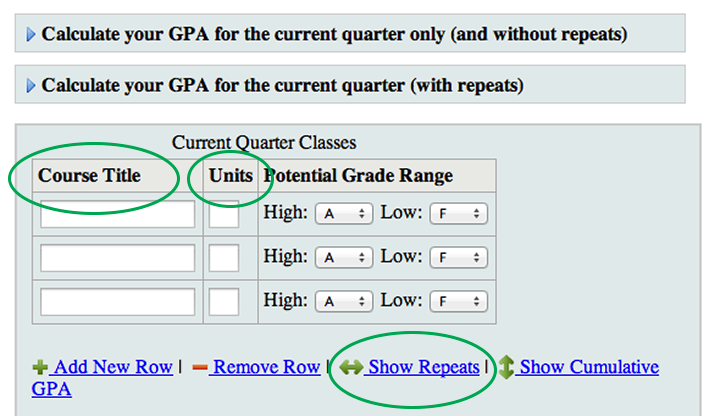 Select "Calculate your GPA for the current quarter term only (and without repeats)". Next enter your courses you are currently registered for under “Course Title” order to learn about the grades you will need to receive in your current term GPA. As you input grades, your “GPA High” and “GPA Low” will fluctuate. 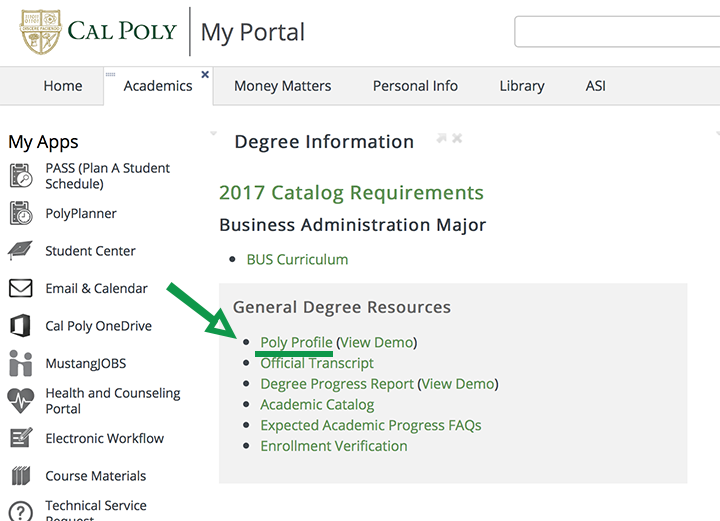 If you want to calculate grades with repeats, please see the other document titiled "GPA Calculator with repeating courses"
Once you have successfully logged into your Poly Profile, scroll down until you see this category of information. 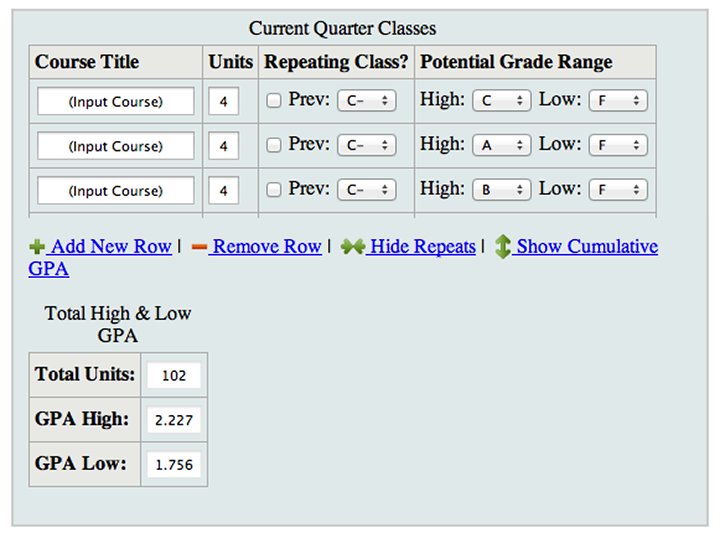 Click on the “GPA Calculator” link. 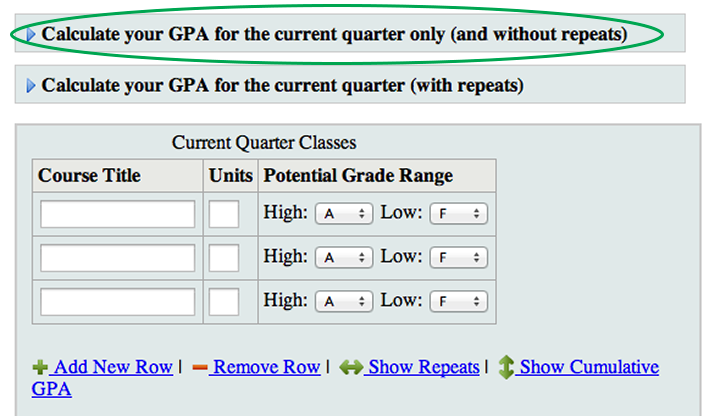 This will automatically populate your current Cal Poly Cumulative GPA (CPSLO GPA). Enter your courses you are currently registered for in order to learn about the grades you will need to receive in your current term GPA. 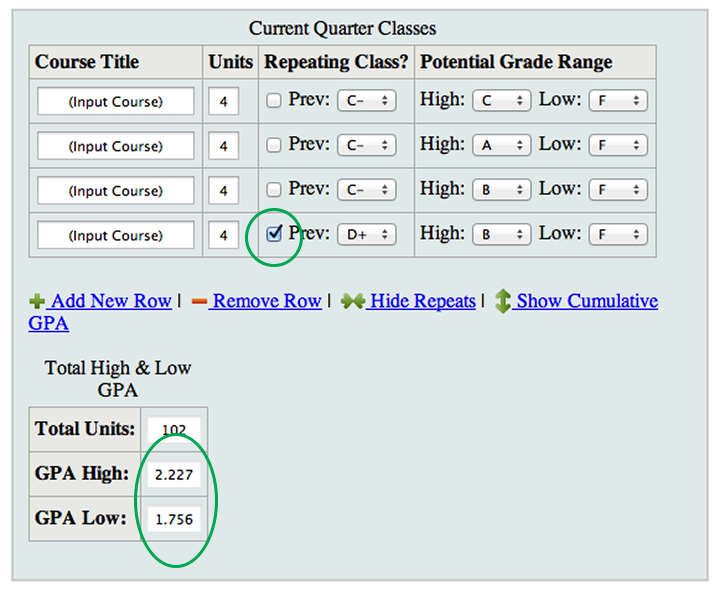 Input current courses in each “Course Title” column, and include class unit amount in “Unit” column. You can develop both “high” and “low” potential grades to predict the outcome of your GPA based on these potential grades. If you are repeating a course in Fall, click the “Show Repeats” option to calculate how the Grade Forgiveness Policy will benefit your GPA. As you input grades, your “GPA High” and “GPA Low” will fluctuate. Use these GPA fluctuations to determine the grades you need to receive in Fall Quarter to get off of Academic Probation. The classes that count in your Major GPA are those listed beginning in the left top corner on the Curriculum Sheet under the heading “MAJOR COURSES.” Courses listed under Support and GE do not count in the Major GPA. Include Technical Electives, Concentration Courses, and/or Approved Electives as specified in the MAJOR COURSES section. Leave the Current Cumulative GPA table blank. Enter the name, number of units, and your actual grade for each course. Note that the “grade range” will be the same for both the high and low grades; e.g., if you have a B in a class, put in B for both High and Low Range. If you repeated major courses and the grades were averaged, not forgiven, include such courses in your calculations. Enter such courses twice, with the corresponding grades. An unforgiven grade is noted on Poly Profile with an “Exclude Earned” notation.